When you’re working hard and have a lot going on, it’s not always easy to eat as healthily as you’d like. Planning what you’re going to eat ahead of time and taking some time out of the workplace every day is essential to create a healthier lifestyle at work. 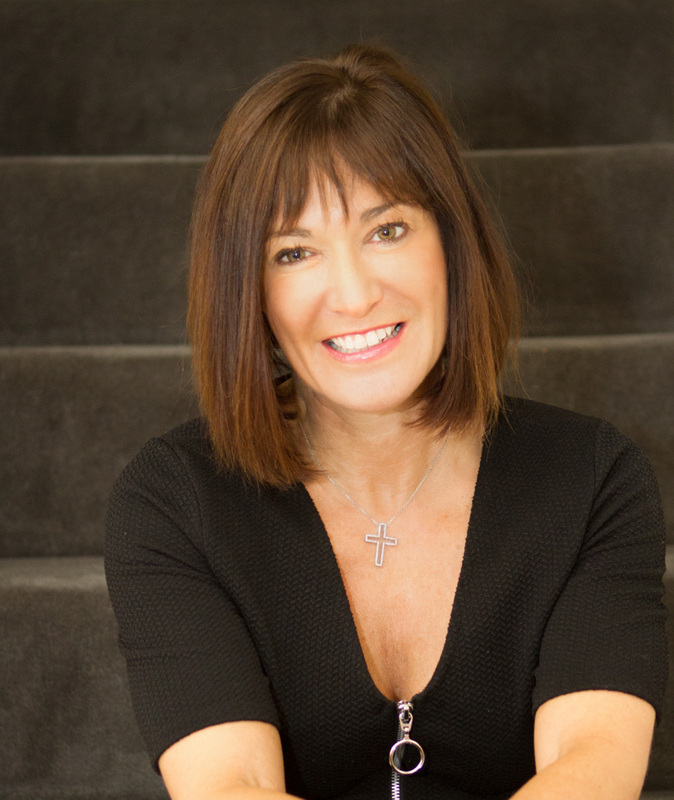 Clinical Nutritionist Suzie Sawyer gives us her top hacks for a healthier working day. It is easier than you may think to eat healthily during the working day without too much planning – a few simple changes here and there can have a massive impact on your stress and energy levels throughout the day. And, most importantly, they’re all realistic and sustainable! Moving away from your desk to eat is my number one tip. 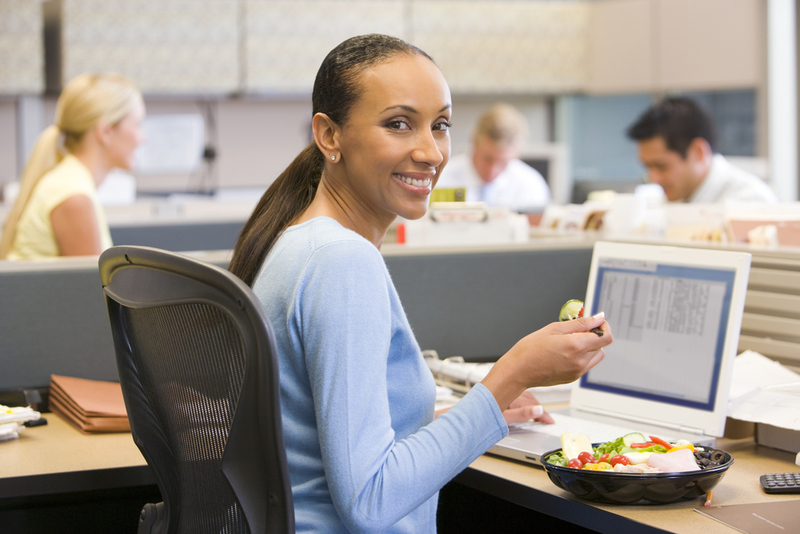 By moving away from your desk and eating slowly and mindfully, you’ll sit much more comfortably during the afternoon and you’ll have absorbed a lot more nutrients from your lunch! It’s important to know that if you’re not digesting your food properly, it can have a massive impact on your overall health. For example, if you’re stressed, and the stress hormone cortisol is rushing around your body as part of the normal fight or flight response, blood flow to your digestive organs will be impaired. This means that you’ll secrete fewer digestive enzymes and your digestive organs will be less effective at breaking down food. So just taking your mind (and yourself) away from work whilst you’re eating can improve your digestion tremendously. Do you suffer from the dreaded 3 p.m. slump? It is around this time that workers often start to feel very sleepy, concentration waivers and productivity is reduced. Part of the reason for this afternoon sleepiness is eating too many carbohydrates and not enough protein at lunchtime. People mistakenly believe that starchy carbohydrates such as rice, pasta and jacket potatoes are filling but it’s actually protein that provides that feeling of fullness. Additionally, any wheat-based foods can contribute to the tiredness. So make protein the main part of your lunchtime meal: consider sources such as chicken, tuna, prawns, sardines, eggs or why not try lentils, beans and tofu as veggie options. These foods can be part of a salad, wrap, soup or pasta dish, but pasta with a tomato sauce alone is not going to keep you going through the afternoon! On the subject of protein, quinoa specifically is top notch. Although it looks just like a grain it’s actually a seed and it packs a punch in terms of its protein content (around 8 grams per cupful). It makes a fabulous base for a salad or risotto that’s delicious cold and can be easily transported to your workplace. You can boil up a batch at the beginning of the week and it will happily keep for a few days in the fridge. Let your imagination run wild with what can be added to quinoa; tinned tuna, prawns, salmon, tomatoes, sweetcorn, avocado, chicken, tofu, roasted vegetables …… the list is endless. 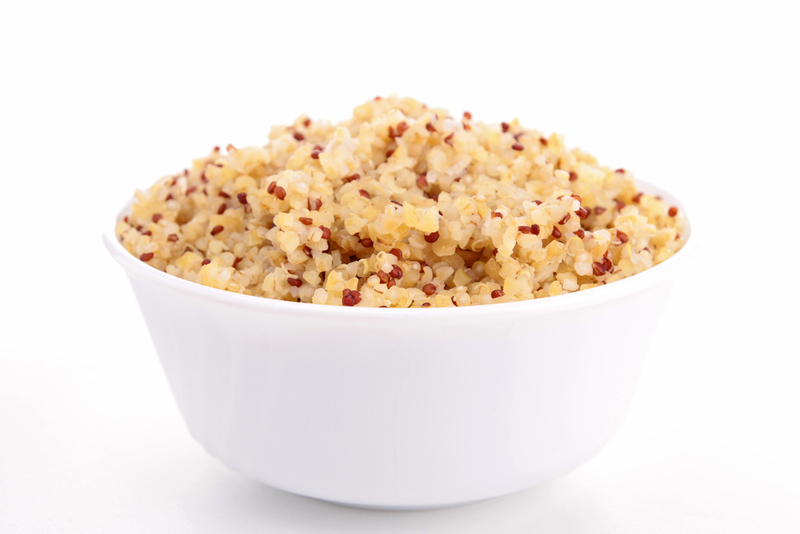 Quinoa is very low in fat, high in fibre and contains a good spread of minerals. Other grains that you might consider instead are spelt, kamut or amaranth. They all taste slightly different but each has a great protein profile plus they’re all gluten-free for those whose digestion can’t tolerate gluten. You need to eat at least every three hours or so. However, this can be challenging if you’re spending eight hours or more at work. Therefore, you’re going to need to eat some form of snack, perhaps halfway through the morning and during the afternoon, in order to keep your energy levels stable. 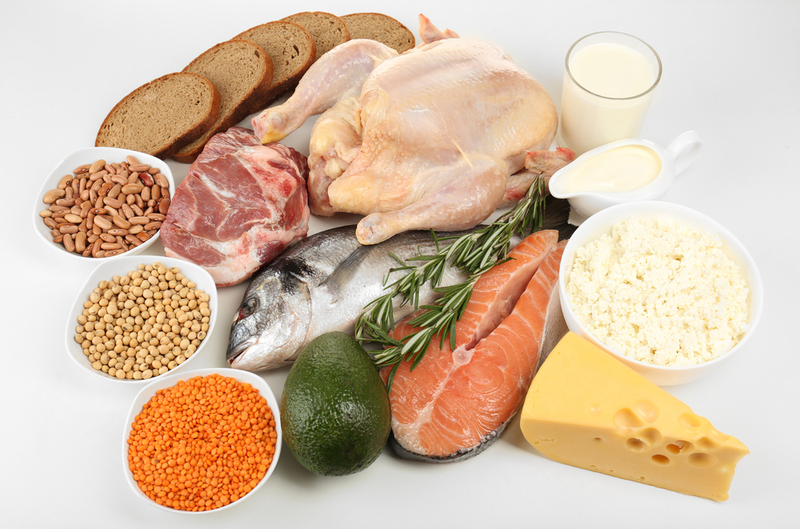 Again, protein is key in order to keep your blood sugar levels and, therefore, your concentration in good order. Walnuts, Brazils, and almonds, together with some seeds make great snacks to keep in your desk drawer and you can find some lovely combinations of these mixed together, in the supermarkets. Alternatively, here are some other snack options that you might want to try: a few spoons of natural yoghurt with some berries, apple or pear; oatcakes with hummus; Trek Bars which have a high protein content; healthy seed/dried fruit bars, perhaps sweetened with some cacoa. Cacoa itself is a great and delicious alternative to chocolate, is high in protein and lower in fat. 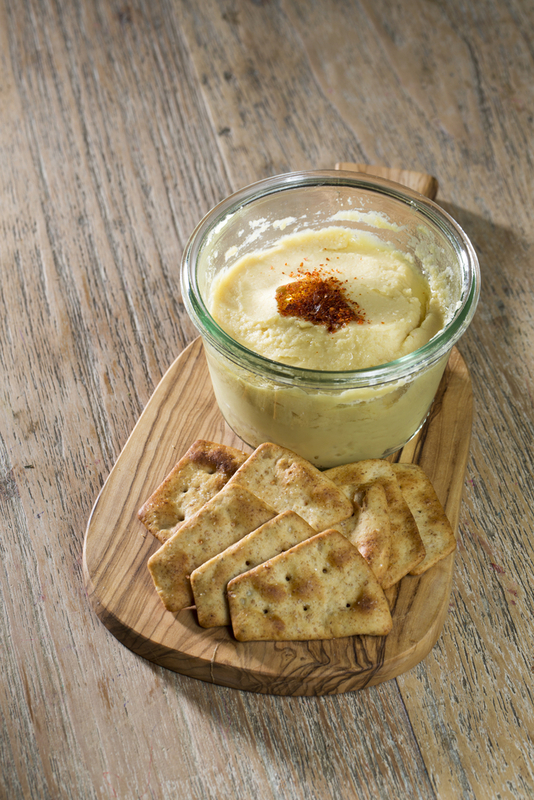 You can also buy it as a butter which is excellent on crackers or oatcakes and makes a great snack. Even better, cacoa also gently satisfies those sweet cravings. Whilst you should be eating away from your desk, if you can also take at least a 15 minute brisk walk every day you’ll be doing your overall health a massive favour. Firstly, taking a walk after eating really helps the insulin and glucose response in your body. This means blood sugar levels will be better balanced, but it’s also very effective in terms of weight management, so it’s the best time to get walking. Secondly, it goes without saying that getting some fresh air is going to clear your head: taking some really deep breaths whilst you’re walking is also great for stress – it helps to better metabolise the adrenalin surging around your body and relaxes your muscles. Many people, particularly within the larger corporates, are now holding meetings whilst walking, with managers connecting with individuals within their teams and conducting the meeting on the move. It’s a fabulous idea and hopefully more companies will adopt this practice. So with a few healthy hacks that just require a little planning, you can have a much healthier working week. Stick to these changes and the benefits to your health will be incredible!